During Henry William Lewis’s visit last month I suggested to Suzi Armstrong, owner of The Bookstack, that it would be amusing to set up a kind of performance art display in her shop window: Writer at Work. We compared calendars and came up with this week. Every day this week, from about 11:30 to 2:00, I’ll sit in the window of the store and write. I began today and almost immediately attracted attention. A reporter from the local paper walked by and came in, doing a quick interview with me and talking to Suzi. Various other passersby spotted me and came in. So our display is bringing in some business, which was one of its purposes. The other purpose was to focus my attention, which wanders wildly when I work at home. 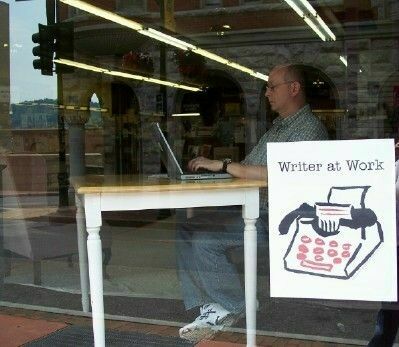 In the window, though, I have to look like I’m working; I can’t check email or surf the net; so I might as well write. Which I did today, producing 6 pages of a new story that I conceived last night. My goal is to have a decent draft by the end of the week. Have you seen this? Check out The Writer at Work. This is such a swell idea! Good for you. >What would blow the doors off of this idea is to have another monitor turned to the window, so the passers-by could watch the words as you wrote them! >Wow, Cliff, this is great. Hopefully you will get a lot done! And sounds like you’re helping the store too. I just stumbled upon your blog yesterday while searching for “IU Writers Conference.” I was at the conference this year, in Richard McCann’s workshop. Too bad I didn’t know of you before; I would have stopped to introduce myself. I would love to know your thoughts on how this conference compares to others. It was my first ever conference experience (with partial scholarship) and I am wondering about the “big” ones like Bread Loaf. Regardless, I am thoroughly enjoying your blog. Best of success to you in all future efforts! Sorry I didn’t meet you at IUWC. I met several people in Samrat’s workshop but basically none in Richard’s, or any of the poetry ones, which I think is a flaw in the design. Both Sewanee and Bread Loaf (the 2 “big” conferences I’ve been to) do a better job of that, probably because all meals are communal, not to mention the fact that they’re both longer–11 days or so. Both are also pitched at more experienced writers, so craft sessions are somewhat more advanced than the ones I attended at IUWC. And because both Sewanee and Bread Loaf are in pretty isolated locations, there are few distractions. I’d definitely recommend that you take a look at them.